Draw My Party is on the Scoops page of New York Family Magazine! I made it on the Scoops page of New York Family Magazine (http://www.newyorkfamily.com) for the December 2015 issue. It makes me sound like I almost know what I'm doing with this caricature stuff. Check out the whole magazine when you get a chance. 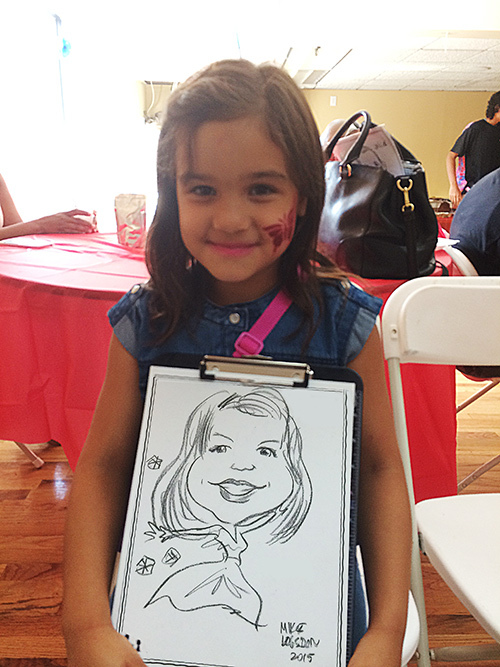 I had two caricature parties on Saturday. The first one was at Aspahlt Green, a gym in Manhattan. The kids were great there as usual. The second one was a birthday party with a bunch of 9 and 10 year old girls. 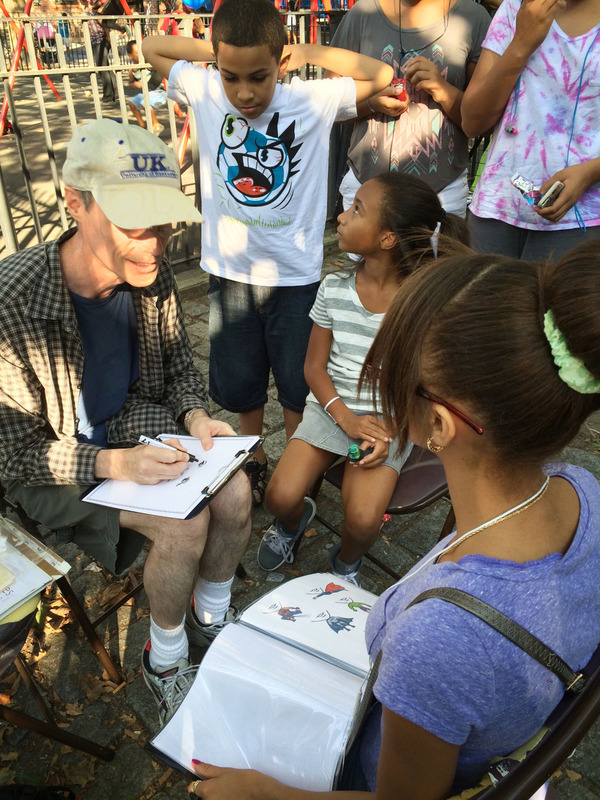 As you can see, they all crowded around to watch each other get their caricatures done. New York Family Magazine Wrote an Article about Me! New York Family Magazine wrote an article about me! 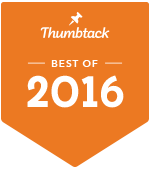 Click this link http://bit.ly/1N9kLkC! to read all about how I started Draw My Party. See why I love it so much, and what my favorite part of the job is. Check out my new Facebook page at www.facebook.com/drawmyparty. Join my Facebook community! I did a birthday party at a playground outdoors yesterday. As you can see, the kids really clustered around me, which added a lot of energy to the day. The little girl in the striped shirt helped me throughout the whole party as my assistant. It was very sweet of her, and I gave her an extra caricature for her help. I had a great party yesterday at Asphalt Green in Battery Park City, in Manhattan. The kids were great, and the atmosphere was so pleasant and welcoming. I love parties like that! I also have to give a shout-out the photographer at the party, Mary Jane. She was a wonderful person, and her work is great! I did another birthday party yesterday, which was a lot of fun. It was held outdoors, and it was a beautiful day. The only problem I had was that I left my china marker out in the sun at one point, and the crayon part started to melt. I had them bring me a little bucket of ice to cool it down, and it fixed the problem! You have to be able to think on your feet, so to speak, at these events. Here are photos from a birthday party I did yesterday. This one had about 50 kids, a clown, a DJ, and me! It was a great time. This past Saturday I drew caricatures at Star Wars Day at Barnes and Noble. It was as fun as it sounds. Here are a few happy customers. I drew more Princess Leia’s than anyone else, both with and without the donut hair style. Several people wanted Jabba the Hutt! I look forward to more events at Barnes and Noble. Yesterday I drew caricatures for Barnes and Noble’s DC Comics day. It was set up in the children’s section of the Union Square store in NYC. I drew a lot of the kids as superheroes, but I had the usual ballerinas, and, in the case of these brothers, boxing. It was so cute when the little boy wanted to be just like his older brother. In the top picture I had the mom stand behind me, to keep the child facing forward. It’s an old trick of mine. Another trick is to get on the floor, on the child’s level. Often that’s the only way to get a good drawing, especially for the younger ones. Next week I’m there for Star Wars day, so I’m looking forward to that one. Stay tuned for pictures from that one. I am thinking of renaming my website, and business name. Caricturesbymikelogsdon.com is entirely too long, and even I misspell caricature half the time. I should have given it more thought at the beginning, but alas, I did not. Here is what would be the new logo, next to the old one. Visually it doesn’t change that much, but I think it will be easier for everyone all around. 1. Keep in mind that persistence is one of the most crucial elements of success. Just keep at it! Cold calling party planners and people like that is definitely out of my comfort zone, as it probably is for most people. It has brought me a lot of contacts, though. 4. Work from your strengths. This advice is sort of the flip side of the previous piece of advice. I’m very good at the one-on-one interaction with the customer while I’m drawing their caricature. 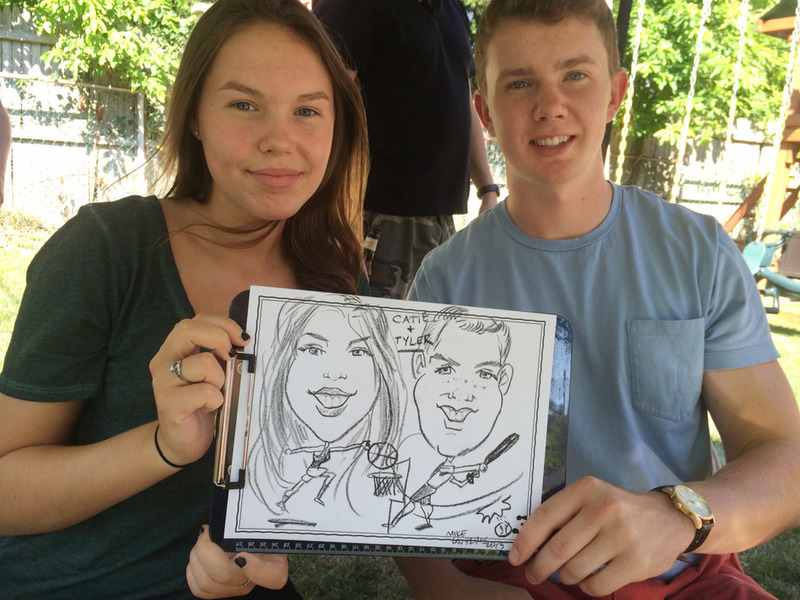 The other day I went to a park and tried doing free caricatures to drum up business. It’s the first time I’ve gone unannounced to to something like that. It didn’t go that well, but it gave me information to use for the next time. The next time I’ll take a big sign for one thing. I’ll also find a place with a bigger variety of age groups and types of people. 5. Solicit advice from people. People love to give advice. Some of it is good, some is terrible, but listen to it all and use what you think will help. My wife has been very helpful, and I should probably act on more of her advice. I’ll add more ideas later, but I hope I’ve given you something to chew on. Just keep at it! 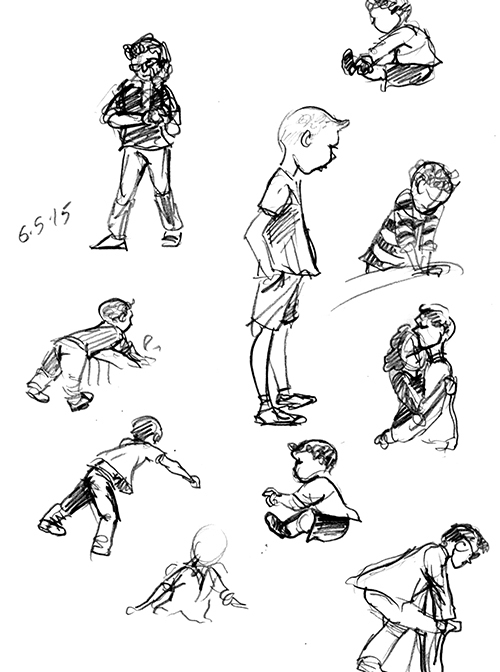 Here are some sketches I did today in the park. Emma and Alice love the little baby with the shorts. They liked me so much at Cipriani’s they asked me back, to get the people I missed the first time. Here are a few samples from my trip there yesterday. Here’s my Uncle Tommy Logsdon, a Father’s Day gift from his daughter Donna. She actually had me tone it down a little bit, to keep the drawing kind and gentle. Let’s hope he agrees. Here is my latest video, a Father’s Day present from my cousin Donna Logsdon to her dad, Tom Logsdon. It’s a surprise, so don’t tell! Look at this motley crew! I put all the heads together from each of the two Cipriani offices. They really kind of jump out at you all together like this. I sent a copy to each office. I’m hoping they put them up and everybody asks about them. It might give me a whole new angle, and I can draw offices all over town. 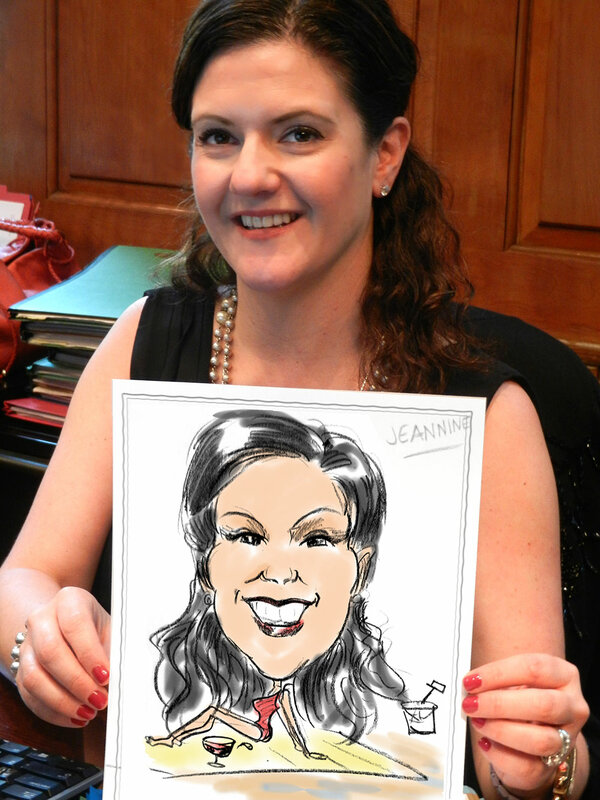 Today I drew caricatures of the Cipriani’s office staff. Cipriani’s is a swank restaurant and event space in Manhattan, with several locations. I got to draw the charming and funny staff at the Wall Street location, and at the 42nd Street location. Cipriani’s is always throwing big events with celebrities. Tonight Snoop Dog was scheduled to be there. Check out my ad in Big Apple Parent! It just came out today. Woo Hoo! I made the big time. 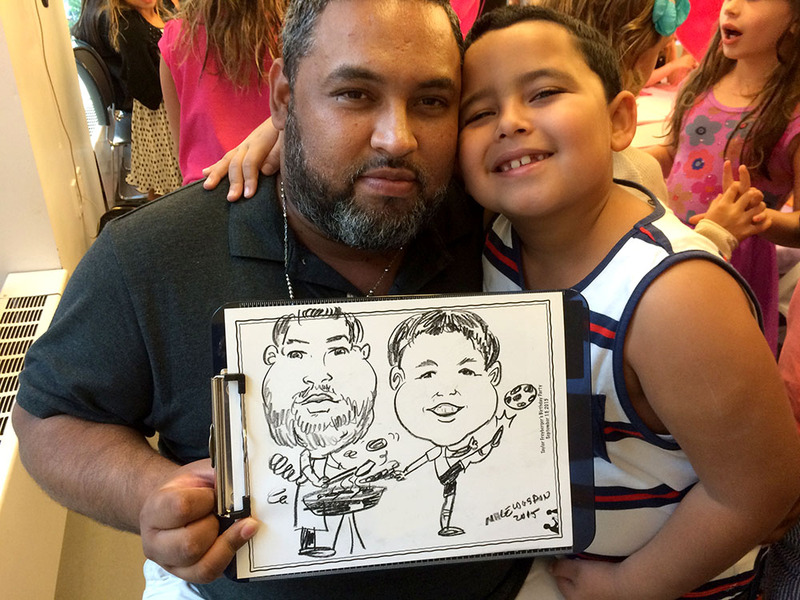 Take a look, and give me a call if you want a great caricature artist at your next party. Do you want a truly memorable gift for Mother’s Day? 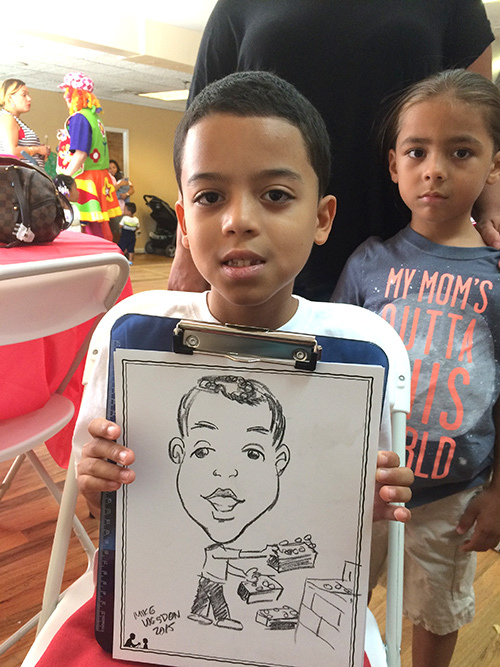 How would you or your loved ones like to see not only a caricature, but a video of me drawing the caricature? It would be similar to the Wizard of Oz video you see here, or the Princess video from below. Stay Tuned for More Details!!!!! !